Oliver is 1 1/2 now and is learning so much! He loves to play and does really well with fine motor skills for his age. I am constantly trying to think of new things for him to do and wanted to share some of our favorite brain-building activities for babies and toddlers that we have done with him to help him learn and help with different developments. I find it super important to give my kids the best start possible and do everything in my power to help make sure that they are where they should be developmentally. Stimulating cognitive development is important for developing memories, concentration and perception skills! Adalyn learned many new words by sitting in the stroller on a walk and us pointing out the grass, trees, sun, sky, clouds, houses, etc. When there is not much to do, we try to use this time to teach the kids different things. From the day the kids came home from the hospital, we started putting them in the stroller and taking them on walks. It is super important to me to get out of the house and get exercise and fresh air is great for babies too. We are big on music and dancing in our house. Oliver has a favorite song already that he can hum along to- “Let it Go” of course! He borrows Adalyn’s microphone and sings into it all the time. This helps teach new words and the dancing is good for their bodies and to practice different types of movement. Babies can start listening to music from early on and love to be sung to. I think that it helps them learn words earlier by hearing different music. I remember when the kids were tiny babies, Troy would dance with them all around the house. We keep a few toys at my parent's farm for when we go up north and blocks is one of the items. It encourages creativity when he plays with them and helps him learn how to stack things up. Babies can start playing with blocks probably around 5 months old. I remember Adalyn loving this at 6 months old for sure! When we go out and have lots of extra time such as on a car ride or on a long walk to school, I go over animal sounds with Oliver. We talk about that a cow says moo, a cat says meow, etc. It is adorable hearing his little voice say different animal sounds. One of the best ways that Adalyn learned tons and tons of different words was to read and read and read to her. I like simple board books for this age in topics that your child is interested in. Adalyn loved animals so we read lots of those pointing to different animals. Oliver loves tractors and trucks so we read a lot of those. I say things like “where is the dog?”, “where is the tractor?”, etc. This helped Adalyn learn different words so quickly. You can start reading to a baby from birth on. During the nicer weather months, we took lots of trips to the beach and brought inexpensive sand toys for the kids to play with. We also have a local park that has lots of sand for the kids to play in. This is great for imagination, motor skills of scooping up the sand and putting it into a bucket, learning to share, etc. Plus, it’s fun! Babies can start playing in the sand probably around 7-8 months. I have a full-on boy in my house who loves tools, trucks and tractors. We take the trucks and tractors and drive them around on our wood floor and make noises for them. This helps to teach imagination, different noises that things make and helps them get a little activity in. As soon as a baby can hold a toy, about 3 months old, they can start enjoying different toys and learning from them. For my kids, I also focus on brain supporting foods such as foods with omega-3 fatty acids including salmon, chia seeds and ground flax seed. Other beneficial foods are avocados, blueberries and whole-grains. I breastfed the kids- one for 17 months and one for 18 months. 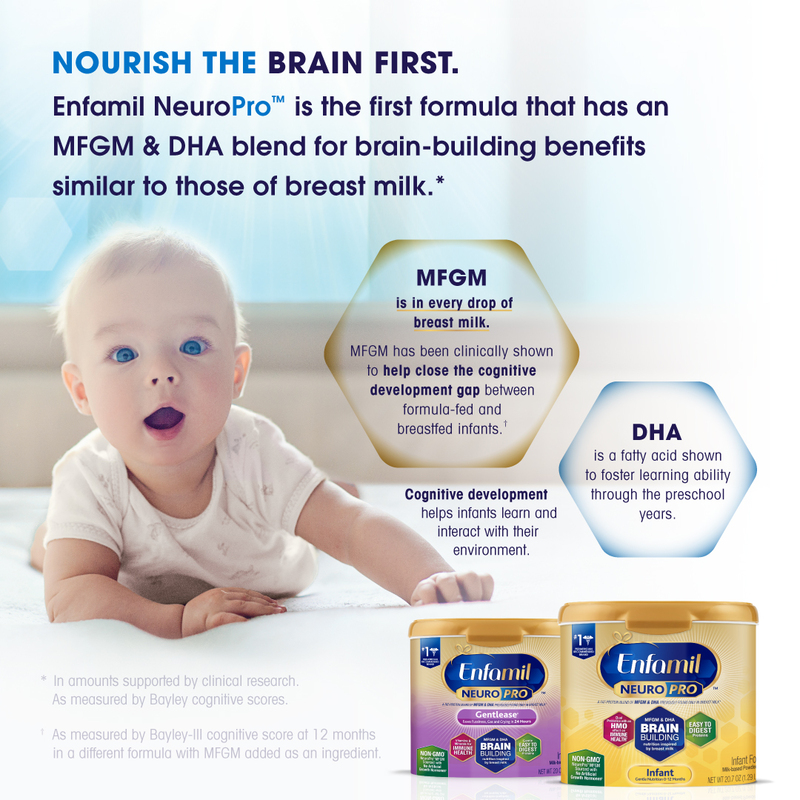 If I was not able to breastfeed or needed to supplement, I like EnfamilNeuroPro™. It has a brain-building fat-protein blend of MFGM and DHA that are also found in breast milk*. MFGM has been shown to help close the gap in cognitive development between formula-fed and breastfed infants**. Development is so important and knowing that your baby is getting excellent nutrition is so important. As a dietitian and mom, I know the importance of DHA for brain development and think that it is great that this formula has DHA.